Sweet little Luna the Unicorn is a lovely lovie - baby comforter - blankie or blumbie. Her little gold horn just makes her. 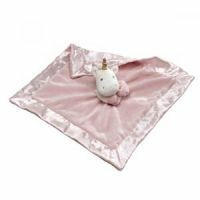 Her blanket has a lovely satin trim and lining and her blanket is lovely and soft. A baby comforter is something that stays with a baby as they grow up and its always cherished.